Wu Xing《五行》 is a new EP two person performance group, The GUIGUISUISUI Show. The EP is the first in what is supposed to be a trilogy of EP based off characters the group’s plays during their live shows. If this first EP is any indication, you should look out for the other 2 EPs in the series. 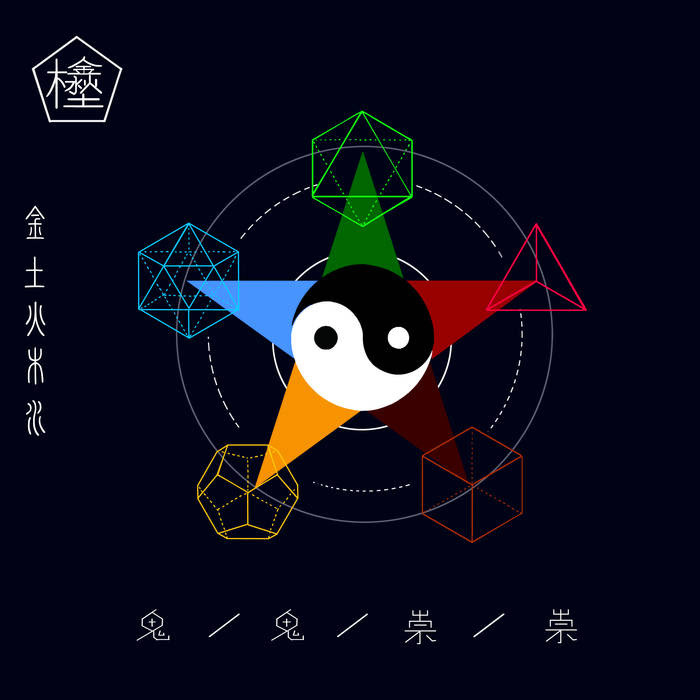 Wu Xing《五行》 is experimental, noisy, complex, and extremely satisfying. The EP is hard to pin down to a single genre. It’s definitely based in electronica with an emphasis on 8-bit sounds that verge on chiptune. However it also has elements of noise, punk, hip-hop, and even ambient. While a project that attempts this could come off as schizophrenic, especially as an EP, The GUIGUISUISUI Show manages to pull it off in a soaring fantastic way. The EP is in some ways split into two parts. Each part has 3 songs. The first 3 songs each act individually and work wonders on their own. However the next three are all part of one giant 26 minute monstrosity that you simply have to let yourself experience. It opens with Low Interest Salvation, which is a perfect way to drag you into this experience. It starts off slow and ambient before exploding into noisy electronics and shouting. The song is textured complex and crunchy and definitely the standout off the first half of the project. The next two songs are slightly slower but are still pounding and fun while strange and experimental. However than we get into Shadow of the Moon. It’s howling yet controlled to the point of mastery. The instrumentals are smooth and soothing and compliment the emotionally charged vocals. This leads into Lee River Pt. 1 and Pt. 2. These songs have no vocals but just chug along with complex intricate electronics. If nothing else you need to listen to these last three songs. Overall this EP is a promising start to the trilogy. With energetic complex instrumentation and controlled emotional vocals, I could not recommend this EP any more. This EP is available from bandcamp.